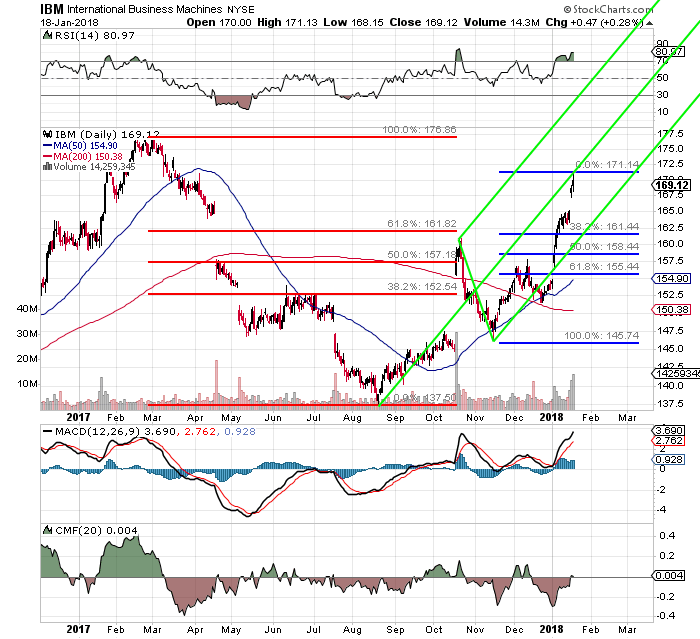 The charts of American Express and IBM both look intriguing after their quarterly results. Friday morning, kids. I know you. You've got this. There are a few things that you do need to know today, before you allow that fancy brain of yours to start making capital decisions. This now said, let's get a few runners on base, so you can drag the lumber up to the plate and try to drive them in. 1) The House of Representatives passed a one-month stop-gap spending bill Thursday night in yet another attempt to kick the can down the road to keep the federal government running. In rare fashion, several politicians did seem to think for themselves as six Democrats supported the GOP backed bill, and 11 Republicans opposed. The ball stopped rolling once the bill reached the Senate floor. That particular legislative body adjourned without a conclusion last night, planning to reconvene later on Friday morning. Immigration will be central to reaching a deal here, and as news leaks, markets will react throughout the day. It might make no sense for markets to react, given how short-term shut-downs tend to be, but algorithms searching the news for key words will try to force some volatility. 2) Crude oil is trading in the hole this morning, and appears to be headed for a losing week. Yes, the Energy Information Administration (EIA) reported another hefty weekly draw on supplies yesterday. However, the International Energy Agency (IEA) announced this morning expectations that U.S. production will scream past both Saudi Arabia and Russia. The agency increased expectations for U.S. 2018 output to 10.4 million barrels per day thanks to current market prices for crude, and improved shale technology. This news has those market prices on the run this morning. 3) SEC slowed down the coming of Bitcoin ETFs yesterday. The underlying product advanced in yesterday's trade after a couple of nasty sessions. That's about where the party stopped for those looking for an easier way to play crypto, and are still not enamored with available futures contracts. The SEC, correctly in my view, has stated in the past that digital currency markets are not transparent enough to allow for acceptable levels of oversight. The regulator has sent to Wall Street trade groups a letter outlining a series of questions that would have to be answered appropriately prior to the SEC getting on board with any ETF or mutual fund company making progress on creating any crypto funds going forward. "It was the best of times, it was the worst of times, it was the age of wisdom, it was the age of foolishness." -- from A Tale of Two Cities, by Charles Dickens. Moral dilemma? Fork in the road. Were you, only a day or two, ago wishing that you had found your way into either American Express (AXP) or International Business Machines (IBM) before those names had become sharply more expensive? Well, do I have good news for you. These two names went into double-zombie beat-down mode after reporting their quarterly numbers last night. So, are these names a bargain this morning? Is either one of these two a better bargain than the other? Think this is just another article written by just another Wall Street talking head? Think again. I'm flat both of these names, and I showed up with two fists looking to make some dough. Let the other guys talk, and keep their hands in their pockets. I'm here to come to a conclusion and act on it after the article is published. First quarterly loss since 1992. 1992? The year hair metal was replaced by grunge? The year the World Series left the U.S.? Yup, but there is a caveat. The firm took a $2.6 billion fourth-quarter charge related to the tax bill. Exclude that charge, and the firm reports $1.58, which beats by four cents. 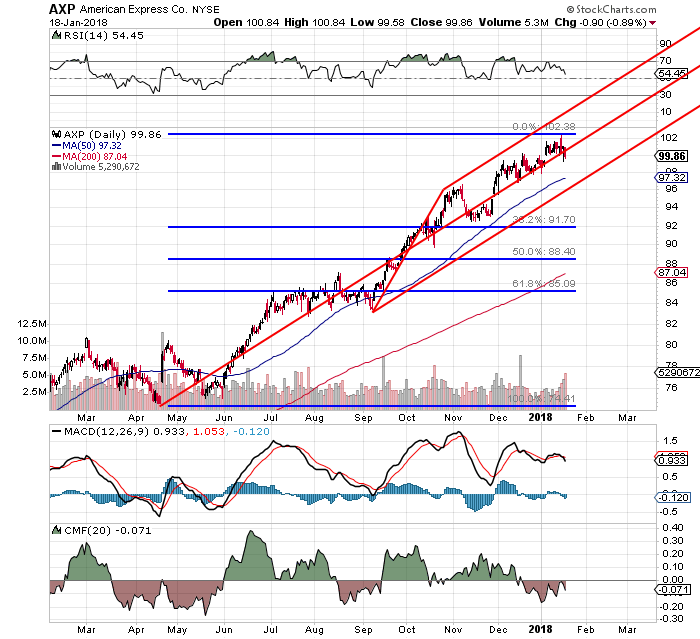 Include the charge, and American Express (AXP) sports a loss of $1.22 billion, or $-1.41 a share. Ouch! Revenue was actually fine, growing 10.2% year over year. U.S. consumer services grew 44%. International consumer and network services more than doubled. The firm suffered an effective tax rate of 31%, which it expects to drop down to 22% in 2018. So, a lot of firms are taking tax-related charges without seeing significant damage to their stock prices. What's different here? Though the firm has seemingly recovered well from the loss of the deal that it had with Costco (COST) , this tax charge is impactful enough that American Express last night announced that it will suspend its corporate repurchase program for the first half of 2018. The firm made sure that you know that the quarterly dividend will not be touched, but it has to repair itself after this hit. One big buyer removed from price discovery in the secondary market. Get it? Am I afraid of AXP? No. That said, I want to see where the big kids leave the name before I jump on board. If I jump on board. The dividend pays 1.4% based on last night's close. I'm glad that the firm is leaving this alone, but that is just not enough by itself to pull me in. You can see that everything went the wrong way for this stock, technically, in recent trade. Relative Strength, Money Flow, the moving average convergence divergence (MACD). Not one of these indicators invites my hard-earned money right here. I want you to look at the Pitchfork. See that break of the central trend line yesterday? That's potentially significant. Where can we buy this? If the lower trendline makes a stand, you're looking at something between $96 and $97. Beware, however, of a run for the 31.8% retracement level. It would be a shame to give up five or six bucks upon entry because one became too aggressive on a tough day. Do what you think. I will likely let this one simmer. I think maybe the worm has turned for IBM, for the better. I know. This firm also took a sizable one-time tax-related fourth-quarter charge, of $5.5 billion to be exact. Like AXP, including the tax charge pushes the quarter below the Mendoza Line. Excluding the charge, EPS comes in at $5.18, a one penny beat. Including the charge, we're talking $-1.14. For IBM, though, this does not dominate the story. The story here, in my opinion, will be revenue growth (the first in 23 quarters), and where it came from. It's no secret that since Ginny Rometty ascended to the top spot at IBM, the firm's performance has disappointed. The firm was literally fighting a battle against itself as interest in older, legacy business decayed. Not really her fault. It looks to me as it the firm is making great progress toward her established goals of integrating the traditional business lines with where business seems to be going. She has moved the firm toward cloud computing, artificial intelligence (both so important), as well as blockchain (Oh, the potential.). Cloud revenue, by the way, screamed 27% higher year over year to $5.5 billion. Did you see Barclays' double upgrade on Wednesday? From Underweight all the way to Overweight. They also raised their price target all the way from $133 to $192. Why? The potential for its cloud business, that's why. I am already long Oracle ORCL and Microsoft MSFT for their exposure to the cloud. I swapped out half of my ORCL for my stake in MSFT a couple of months ago. I will watch this one early. If I see my price, I may swap out what's left of my ORCL for some of this. This chart shows a short-term MACD that had been on the upswing. That is, until the name opens in the hole on Friday. That's fin; technically, the name had become overbought, and had just started to show positive money flow after spending most of the last 10 months pedaling backwards in that department. The name illustrates a past of at least paying some attention to its own Fibonacci levels. I do not think we'll see prices below $162 today, but if we do, I think that would be an obvious catalyst, as both the Fibs and the Pitchfork identify that spot as support. I don't tell you what to do. I do tell you what I'm thinking. I think that if I see a discount in this name today, say $164-ish, I start to leg in. We see that sub-$162 area, I grab a second leg (maybe another quarter of a position after already grabbing an eighth) and pay for it with the sale of some more ORCL. Let's see how this unfolds. The Senate plays some hardball, and we may see some artificial discounts. That won't last. At the time of publication, Stephen Guilfoyle was long ORCL, MSFT, SLB, although positions may change at any time.